WASHINGTON, DC, March 4, 2012 (ENS) – The United States has suffered an average of 80 deaths and 1,500 injuries associated with tornadoes each year, according to the National Oceanic and Atmospheric Administration, NOAA, which provides the National Weather Service. But tornadoes over the last two years have broken that pattern, proving much more deadly than the average. By their nature, tornadoes are difficult to forecast. Now, NOAA is working with NASA scientists and other researchers to provide tornado warnings far enough ahead of the storms to give people a chance to get out of harm’s way. As tornadoes increase both in number and in lethality, a longer warning lead time would save lives, the scientists believe. In southern parts of the United States, tornado season usually peaks in spring, but this year has seen bands of deadly tornadoes marching across the country far in advance of the usual season. On March 2, nearly 100 tornadoes ripped across the heartland, spawned by a powerful thunderstorm system stretching from the Gulf Coast to the Great Lakes. Thirty-seven people across five states have died and hundreds were injured as entire towns were wiped out, homes, schools and vehicles were demolished and thousands of people were made homeless. This year to date, 160 tornadoes have slashed across the country. 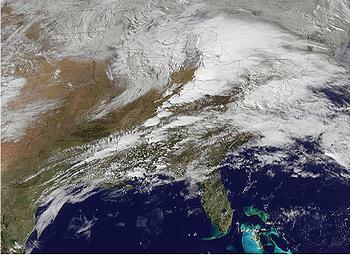 January 2012 produced 75 winter tornadoes, third most of any January in recorded history. Most of them struck southern states. In February 85 tornadoes were recorded. In 2011, there were 1,688 confirmed tornadoes across the country. There were 178 confirmed tornadoes across 16 states and severe destruction during an outbreak that lasted from April 14 to 16, 2011. A total of 38 people were killed by tornadoes and five more died as a result of straight-line winds associated with the storm system. Less than two weeks later the largest tornado outbreak ever recorded killed at least 346 people between April 25 and 28. Then on May 23, 2011 in Joplin, Missouri, 160 people died a tornado with winds that peaked at 225 miles per hour. The Missouri Emergency Management Agency reported more than 990 others were injured. To reduce the surprise of a tornado outbreak, NOAA and NASA are developing the Geostationary Operational Environmental Satellite-R, or GOES-R series, with the first spacecraft expected to launch in late 2015. These next-generation weather satellites bristle with state-of-the-art instruments for improved scouting of these killer storms, even at night. The Advanced Baseline Imager on GOES-R will improve meteorologists’ ability to assess conditions that spawn twisters. Compared to current GOES imagers, the Advanced Baseline Imager, ABI, provides twice the spatial resolution, three times as many channels of information, and more than five times the update rate. “ABI will give us a much clearer picture of the clouds  where and how tall they are, how much and what kind of moisture they hold, and how they are moving and intensifying,” says NOAA research meteorologist Tim Schmit. Most importantly, ABI can better detect the super-cold “overshooting tops” that mean severe weather is imminent. “Overshooting tops portend huge energy inside the cloud  it takes tremendous energy and upward velocity to poke through the lid of the tropopause,” explains Schmit. Lightning is another key to tornadoes. “Studies show that sudden changes in the total lightning correlate with tornadoes,” says Goodman. Detecting lightning is a new specialty of the GOES-R satellite. The Geostationary Lightning Mapper is expected to give seven more minutes of lead time in tornado warnings. Average lead time now is 13 minutes.